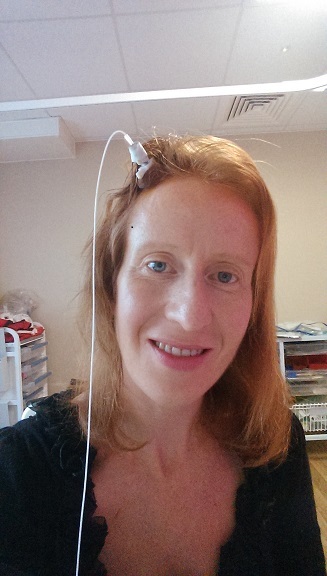 ICP monitoring is a term you may have heard of if you have hydrocephalus. You may have had it before; this post is really aimed at those who are due to have their first, to give them a real idea of what it’s like. I am a firm believer in the ‘knowledge is power’ school of thought. 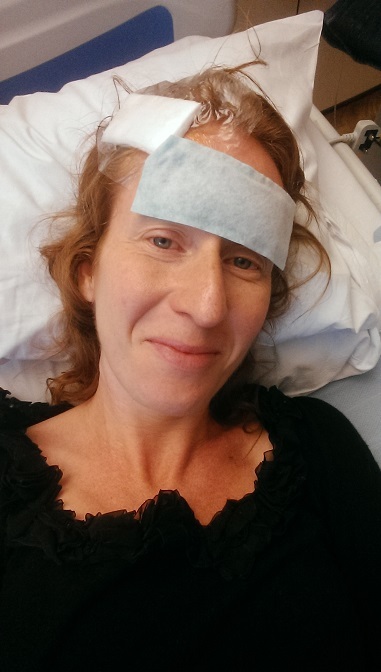 I have had about ten or eleven episodes of ICP monitoring so am pretty old-hat at them by now but even so, my latest experience involved some new experiences so I thought it wouldn’t hurt to write a ‘what you can expect’ guide for first-timers. Doctors and surgeons do have a tendency to be a little blase about such procedures. They’ll tell you about what they’ll physically do and it all sounds very straight-forward. But of course they’ve never actually had a bolt screwed into their skulls with a probe sticking into their brains before so in terms of what it actually feels like (which is the bit we patients are concerned with), the experts are the patients, not the healthcare professionals. Looking back, I wish I’d had more first-hand information from a patient who had had it before, especially the removal part as this is done with you wide awake. I have a lot of patients-to-be on this blog asking me if I’ve had it and what it feels like which is why I decided to make a little video and actually film my bolt being removed – the link is further down. ICP stands for intracranial pressure, the pressure that is exerted by the CSF (cerebrospinal fluid) inside the ventricles of your brain. When this pressure is within normal limits, you generally feel fine. If it’s too high or too low, you generally feel pretty crap. The ‘normal’ limits (as read on an ICP monitor) are between -10 and +15. Of course this will depend on the individual; I cannot handle pressures over +10 and below -12. If I had a pressure reading of +15, I’d probably have double vision yet I’ve been on the ward many times with fellow ‘bolted’ patients opposite me recording pressures of +25 and not really batting an eyelid! Generally surgeons will get concerned if the pressure heads towards +20 and will intervene at this stage. ICP monitoring is a really good diagnostic tool; it reads the pressure every minute of every day and records what’s happening when you’re awake, asleep, eating, standing, sneezing or just reading a book. At my hospital, the National in Queen Square, they hook you up to a laptop as well which draws out an impressive little graph which shows any spikes or dips in pressure at a glance. You may have ICP monitoring if you’re feeling generally off and adjustments to your shunt settings haven’t helped, or if your surgeons are suspecting a shunt malfunction of some sort. I was going to include some photos of the bolt and probe itself but having looked at the pictures I think I’ll leave it as they don’t look like the friendliest of items, to be honest!! Basically the unit consists of a long-ish probe and a bolt which is screwed into the skull; the probe slides through this bolt and is screwed into place with the nut. Literally a nut and bolt in your head. The procedure to insert it is generally done under sedation although sometimes it’s done under a local anaesthetic. It takes only a few minutes apparently. I say ‘apparently’ because I’ve never had it done under a local; it’s a personal preference. I know many who’ve had it placed with just a local anaesthetic and who don’t mind it at all. 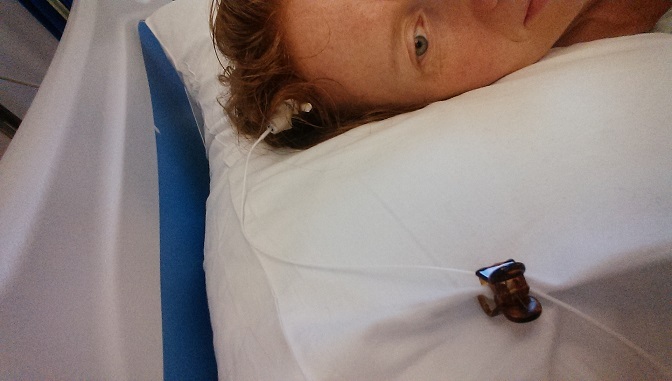 I can handle most things but the thought of someone drilling into my skull whilst I’m awake – nah. The hospital you’re at will probably offer you the choice so it’s up to you! 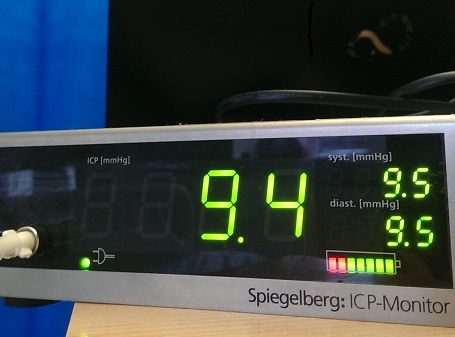 An ICP monitor….during one of the rare times my pressures were reading as normal. they usually set the monitor at your bedside and once you’re hooked up, they can read the pressures all day and all night as well when you’re asleep. You can ‘unplug’ yourself and go to the loo, go for a quick walk and so on if you feel up to it. Once the bolt is in, it does hurt a bit; it’s quite sting-y where it’s been screwed into place and if you raise your eyebrows up it stings even more. The solution is to not raise your eyebrows up or frown. Basically, get botox. You can’t feel the probe inside your head but you will feel it move if you forget you’re plugged in and get up to go for a walk without unplugging yourself first. Nothing bad happens; you just get yanked back to the bed but it does feel a bit odd for a minute! Clipped and ready for snoozeville! (get them from Claire’s Accessories or similar) and clip the wire to the top of my pillow, making sure I’ve left enough room for me to roll in the opposite direction without pulling. Once that’s done, you can get a good nights sleep in. Just don’t forget to unclip yourself in the morning! Depending on how long your surgeon is planning to leave the bolt in will probably depend on whether you attempt to wash your hair or not; if it’s only a few days, you can easily leave it. But for ‘monitor marathons’ like the four weeks I had it in for, you’ll probably want to at least try to wash your hair at some point! This is possible but you just have to be very, very careful; getting the bolt wet is not an option. 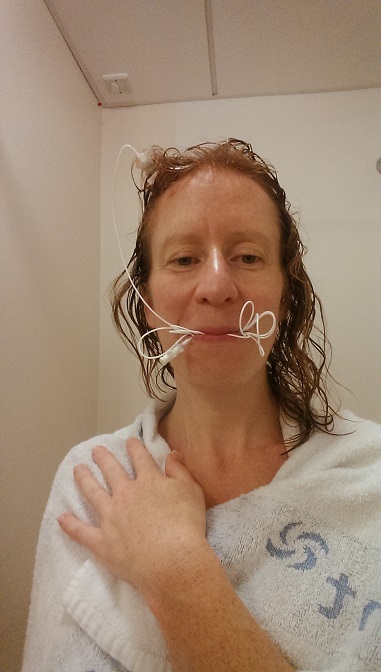 It takes a bit of practice, but it’s do-able; I have found over the years that the easiest method is to gather the wire in your mouth to keep it well out of the way, make sure you can see yourself in a bathroom mirror (so you can see as well as feel where you’re directing the shower spray) and if you can’t see your reflection, get a friend/family member/nurse to carefully place some towelling around (not on!) the bolt to keep it dry. Then, when you wash your hair, you simply wash up to the towel. As long as you keep the bolt and surrounding area dry, it’s okay. Keep the wire out of the way and avoid the bolt…then just wash ‘n’ go! Some hospitals are stricter than others about this but to be honest I’ve never known any hospital keep ICP bolts in heads for as long as they do at the National, so the staff there are pretty understanding about it! Besides, I think it actually helps to keep the surrounding hair clean and not let it get very dirty over weeks, to help reduce infection. I have no idea if that’s actually true but it makes sense to me! Having the bolt removed is often the part that most people are apprehensive about as that’s the bit you will be awake for. It only takes about five minutes to do so you can understand why they don’t bother going through the whole ceremony of an anaesthetic and besides, apart from the stitching-up bit, (which does hurt), it’s really not too much of a bother. I won’t lie; it feels weird. After spending all your time when it was in trying not to knock it or bang it or get the wire caught, it does feel very wrong to have someone suddenly grappling and tugging at it. I filmed the removal of my last bolt in October; the link is right here – don’t worry, it’s not gory – but in case you don’t want to watch it, I’ll describe what happens as best I can. First they get you to lie flat. This wasn’t always the case at the National so it may vary from place to place but nowadays, you lie flat. A nurse or medic will start off by unwinding the plaster or dressing which surrounds the bolt itself, usually soaked in iodine to keep everything clean. Then they’ll unscrew the nut on the bolt to loosen the probe itself. This can feel a bit strange, but noting too odd yet. When they actually pull the probe out, sometimes they’ll ask you to breathe out sharply after three, and remove it on ‘three’…this time they didn’t ask me to do that and all I felt was a slight sting and a strange but very fleeting feeling in my head…then it was out, in a second. After that (and you’ll see this in the video) it can feel like it’s all over – I keep asking ‘is that it?’, rather hopefully! But no, they then have to get the screw out of your skull. This is the bit that does feel odd; the screw is obviously screwed in tightly on insertion so it can be a bit of a job for them to undo it. My advice is just breathe slowly! When they take it out it stings again but nothing terrible. After that they’ll clean the area with iodine; it’ll feel sore but it’s quite a relief to know it’s all out and done with! The final thing for them to do is stitch you up; you may not actually need this but I lost some CSF when they took the bolt out so I needed quite a deep and tight stitch. Now, the truth is this bit does hurt. A lot, if I’m completely honest. I’ve not met anyone who’s had this bit done and who hasn’t thought it to be pretty darn painful. You can actually get a local anaesthetic put in first before they stitch you up if you want, but having had that once, I’d say it’s not really worth it because it takes about three injections to properly numb the area and that really stings in itself! Best to just grit your teeth, get something to grab hold of and get on with it! In the video, you’ll see my big fat fail in just breathing calmly through the stitching bit! It really, really hurt because they had to pull it so tight to stop the CSF leak…it definitely hurt more than any other one I’ve ever had if that’s any consolation! I think it’s because it had been in so long; the longer it’s in, the sorer it gets. But after I’d had a good slug of Oramorph, it died down after about an hour. And that’s it! Bolt is gone, you’ll have a nice stitch in your head and you won’t be tethered to a machine anymore! Freedom! You may be asked to lie flat for a couple of hours afterwards and then you can get up and go home. Very occasionally your head may object to all the probing, tugging and stitching and stage a full-on protest afterwards. Mine did this this time around but it’s never done it before and I know from the experiences of others that it is very rare. I developed terrible pressure, headaches, distorted vision and nausea for about thirty-six hours afterwards. But all that happened was that I was kept in, monitored closely (a CT scan was done but came up fine), given as many painkillers and anti-sickness as I needed and was only allowed home when I felt well again. It was a real surprise that this happened because I did feel very awful indeed, but it was a first. It very, very, very likely won’t happen to you; I am notoriously pressure-sensitive. But I have always said I’ll be truthful in this blog so I wasn’t going to lie about what happened this time around. Generally though, ICP monitoring is a little tedious (being tethered to machines is unusual) but is really, really helpful to your surgeon to determine exactly what your head and your shunt are doing so it really is worth having it done if it’s needed. The discomfort passes and you will hopefully feel loads better afterwards. Plus it makes for some very interesting photos to send to your friends/family/boss to impress them! At the end of the day, although it’s not something I’d opt for voluntarily (given a choice between a days shopping and ICP monitoring, I know what I’d plump for), ICP monitors can really help get to the bottom of not-too-obvious shunt issues and this helps you get better more quickly. And best of all, they’re pretty darn safe. And when it comes to our brains and our health, that’s what we want! Having had ICP monitoring once before, I’d say this is a pretty fair assessment of the procedure and experience. I had mine put in without anethesia, just a local anesthetic and some fentanyl for pain control. I was actually laughing and joking with the guy drilling in my skull and the nurse all while watching HGTV! They did it right in my hospital room and let my mom stay and watch (Dad couldn’t stomach it…to be fair, there was a fair bit of blood). But I’m also weird and totally facinated by all this, so it didn’t bother me any. The weirdest part was being able to here and feel the grinding of the hand drill as they put the hole and then the bolt in my skull. Unfortunately, my high pressure registers as normal on ICP monitoring (though when I got a lumbar puncture a year later, the IR who did the procedure said though my opening pressure only registered at 20 cm H2O–14.7 mm Hg, the fluid came out looking like high pressure). Had they known that back in Jan 2013 when I had my ICP bolt, maybe I would’ve been shunted sooner than a week ago (May 22, 2014). I think the probe only goes into brain tissue and not all the way into the ventricles. I find myself worrying all the time which bit of memory or skill it is hitting in it’s path! I found my hair became self-cleaning after two weeks and actually looked quite OK!I also super hate the stitch bit. Blimey, I wish my hair became self-cleaning after a fortnight! Mine just starts to stick out at right-angles and becomes very angular, hehe! You’re right about the probe; it doesn’t go into the ventricle, it’s the top part of the brain tissue; my mistake! Hopefully in time we’ll all have the new shunt valves which give the pressure readings externally so we’ll never have to undergo ICP bolts again. i have only had my VP Shunt for about 6 weeks now and I wondered what that scar was http://jordantheheadcase.wordpress.com/2014/05/30/whats-it-really-like-to-have-icp-monitoring-and-and-theres-a-video/#comment-form-load-service:WordPress.comon my forehead, thanks. Hello, I am going in for this at the national on Friday and had no idea what to expect as this is my first ever time even going under, let alone having a bold attached to my head! I found this blog after doing lots of searing on google and want to say THANK YOU so much for sharing your story! I am no longer scared and just can’t wait to get the results for the appropriate treatment. I must admit i’m a little nervous about that stitch but hope to calmly breathe through it as you did. I wish you well and good luck to you. Thanks again, Georgia. Thank you so much for this post! I am currently in the National, where I have been on and off for three years (currently one month into a ‘day case’ admission…) as I have spontaneous intracranial hypotension. Except that since my last procedure to fix my SIH, I’ve high pressure and venous sinus stenosis, causing a daily catastrophic CSF leak in my spine (my tear in my spine is at T1/2). I’ve just been told I’m having the bolt fitted tomorrow by Mr Watkins (who I have never met), so it’s good to know what to expect, and that he is thought of so highly! I was diagnosed with np hydro January of this year after noticing a steady decline in my balance and memory loss, I had my shunt fitted on the 19 of June. I’m 60 so I feel more fortunate than most of the people on your blog including you Jordan to have got this far in life before getting this horrible problem! I would just like to say thank you for all the very honest Information about your personal journey as it has helped me so much to come to terms with my own probes, and I love the way you are so up beat about it! You are a real star! I got the icp monitoring fitted in 2 nights ago, coming out tomorrow I hope, was suppose to be today…. Thank you for such an amazing blog. It’s comforting to know that other people are going through similar things and can relate. I have been diagnosed with iih for 2 years now and currently on Acetazolomide 1000 and Topiramate 50 daily. I’ve had 4 LP’s, all of which my fluid was between 38-45. On the waiting list to have my ICP monitoring at National in April and extremely nervous. This is to determine if I need a shunt or not. May I ask, when do the surgeons tell me how long I will be staying in hospital for? I only assumed ICP monitoring would only be a day case but I see its for a month? Is this because some of you already have shunts in place? They have also specified to me that I will have to stop taking my acetazolomide and Topiramate for a week before the monitoring?! My eyes and head can’t cope if I miss one tablet! I really don’t know how I will manage a week! Thanks for this very informative and honest account. My sister has gone to the national today and will be having this procedure tomorrow. I like to be prepared for any visit to the national, so thank youoagain. I just found your blog about a month ago, Jordan. I have had Hydrocephalus and a shunt since I was 8 months old in 1968; that means I’m almost 50. I’ve only had three revisions, the last one was almost 28 years ago – – – I’m feeling very guilty having been so fortunate, when I read the blogs and stories of people who have not had my luck avoiding surgeries. So I’m grateful to having found your blog, and your calm, pragmatic demeanor about all of this. Thanks for your presence on the internet, it made a difference in my life. Thanks for that helpful info. Please could you tell me what the ‘at home’ recovery period is after its take out? My son is 7 and due to have 1 done for the first time in a month and it worries me that he probably will be conscious for the removal. Thanks Jordan that is very reassuring. Came across your blog as someone posted about it in a group yesterday. My NS talked about doing one but wants to do an angiography first. My LP is 15 but i have intense pressure headaches as soon as i do anything of my daily routine. I just dont fit into the typical mold. Do you have a shunt? A stent? Or what is the reason for your repeat icp monitoring. I am just trying to figure everything out and scared i will get dismissed. Hey Jordan. Im getting my first ICP monitoring next week. I’ve got aquired obstructive hydrocephalus. I was born 3 months early. I’m now nearly 24 years old. I’m absolutely terrified to be perfectly honest. I was admitted to hospital in august 2017 with an agonising headache. I had a lumbar puncture, which caused me to vomit a lot about 2 days after it was done, and I felt extremely dizzy and I was sweating profusely. My pressure was +20 which clearly was causing a lot of pain. I was kept in for 5 days, and I was allowed to go home, with a follow up appointment with a neuro surgeon. I saw him in November 2017 and he said I was to get the ICP measuring done. I received a call from the Neurology department last week and I was asked to go into hospital on 27th Feb 2018 and the ICP monitoring will be done on 28th Feb. What worries me most, is the fact that my mum passed away in 1999 with a brain haemorrhage that she didn’t know about. She was 30 years old. I’m scared that the same will happen to me. I live in Scotland, UK. I’m just really scared. I also suffer from bad anxiety so that’s not helping. Any help or advice would be appreciated. Thanks! Great read and I love you sense of humour. I’m having something very similar soon. As far as I’m aware. Thank you for sharing. Question, they don’t have to shave that area of your head for the ICP Bolt monitoring? So they didn’t have to shave that area of your head for the ICP Bolt procedure?